SOUTH BEND, Ind. - Pete Buttigieg officially entered the crowded 2020 presidential race Sunday, marking the young Midwestern mayor's rise from political obscurity to a notable name in the Democratic field seeking to replace Donald Trump in the White House. The openly gay millennial leader's announcement capped a week of heightened media attention - driven in part by his criticisms of a fellow Hoosier, Vice President Mike Pence. 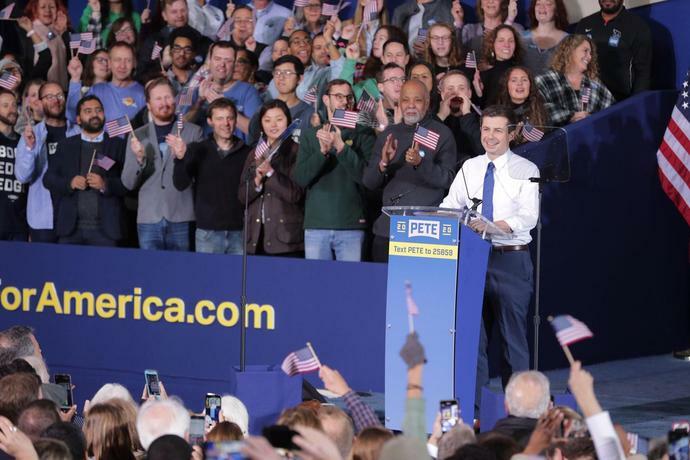 And in an unintentional nod to his ties to Pence, Buttigieg made his announcement at the Studebaker Building 84 - a former South Bend auto plant undergoing renovations because of a partnership between Pence and Buttigieg. "It is time to walk away from the politics of the past and toward something totally different. ... My name is Pete Buttigieg ... and I am running for president of the United States." Dayton Mayor Nan Whaley pointed to the very building audience members stood in as an example of Buttigieg's success. Buttigieg didn't promise he would refill Studebaker with long-gone factory jobs, she said. "Instead, he saw this piece of South Bend history as a symbol of its innovative future," Whaley said. In the past week, polls from both New Hampshire and Iowa - early-voting states for the Democratic nomination - showed Buttigieg in third among the party's voters, behind only Sen. Bernie Sanders and former Vice President Joe Biden. "He's fresh, he's new," she said. "I don't know whether I can say this or not, but he hasn't had time to be corrupted." The public attention that helped yield that haul, however, has also brought him more criticism for his comments on Pence, particularly in the past week, and led to a high-profile back-and-forth between the two Hoosiers and their supporters on homosexuality and religion. "That's the thing that I wish the Mike Pences of the world would understand," said Buttigieg, who often references his own religious beliefs. "That if you have a problem with who I am, your problem is not with me. Your quarrel, sir, is with my Creator." Renovations on the building were made possible only by $3.5 million from an economic development program Pence championed in 2015 as governor - even pushing back on his own party. "Buttigieg might be earning headlines for his mean-spirited attacks against our vice president in this who's-the-most-liberal Democratic primary contest, but we know the truth," said Kyle Hupfer, chairman of the Indiana Republican Party. "This Sunday's announcement - and the very venue housing it - wouldn't be possible without Mike Pence." "It's refreshing," he said. "For so long, I feel like Democrats and progressives were afraid to talk about religion, but if you look at the teachings of Jesus as I know them and as Pete has expressed them, it is helping the disadvantaged, helping women, helping people of color, helping LGBTQ people, immigrants and all of those groups." A married gay man running for president, and that&apos;s not disqualifying? Six months ago, I'd have said, &apos;No way, no gay.&apos; Mayor Pete changed my mind.